Function complex in this context is defined as a hierarchical set of all physical/chemical properties involved in any activity of a structure that conduces to the organism’s fitness (elaborated on previous definitions by Bock, 1980 and Barel, 1993). As a level of explanation, ecomorphology is preceded by functional and constructional morphology (Barel, 1985): the first level of explanation concerns the functional significance of a form and the second level of explanation deals with the spatial interactions of forms within one organism and the effects of these interactions on their functioning. This results in the morphological explanation of the (in)compatibility of functions. On the ecomorphological level, finally, is investigated how well compatible functions are related to environmental conditions, which may provide us with new information on the original forms. An organism can be considered an integrated unity of forms and functions. Analysing what such an integrated whole of forms and functions means, is subject of the holistic procedure of functional morphology (Barel, 1983). Forms have various aspects like size, shape, compound- and topographic structure (Dullemeijer, 1974; Barel, 1985). The forms are separated through their – often presumed – functions. 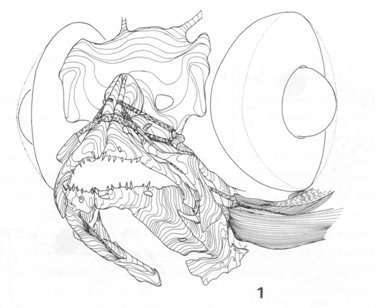 Accordingly, forms are not separated through their ontogenetic development as in classical anatomy. Functional morphology aims to investigate the relationship between form and function. Often a combination of form characters is necessary to execute one function. Such combination of forms is called a functional component (Dullemeijer & Barel, 1977). The consistent correlation between a specific form and a specific function can be described using regression computations. Only when it is clear how in the given form-function relation the function is executed by the form, one can speak of a functional-morphological relationship. This becomes evident when the form is predicted by the function or, the reverse, when the function is predicted by the form. Such a deductive approach may use a computed model that is independent of the anatomical reality that it should explain. All functional components should fit within a restricted area. 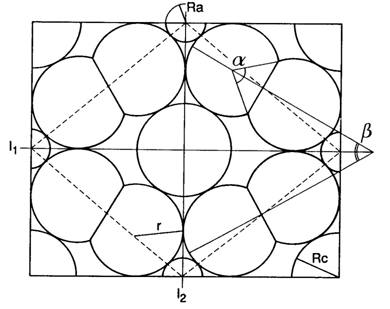 The geometric relations of form-features belonging to one or more functional components within a defined space are described by the constructional component (Barel, 1983). With various form-features as variables it should be computed what constellation of the constructional component can accommodate a required form. The relations between form-features of different functional components concern their spatial relations. 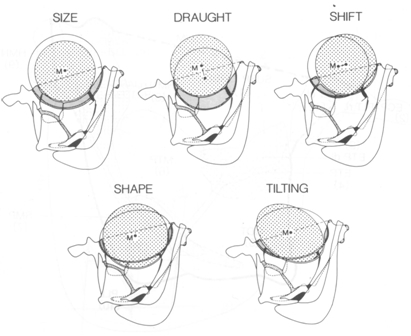 Both spatial demands and functional demands determine what range of certain form-features is allowed. The presence or absence of an overlap between the ranges of form-features for different functional components determines whether functions are deductively compatible (cited from Barel, 1983). In its simplest approach the results of the analysis of form-relation are correlations. Many comparative studies are concerned with this type of form-relation. 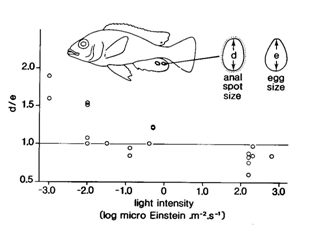 However, the observed correlations may also be used to generate or to test a hypothesis on their biological significance (cited from Barel, 1984). Constructional morphology deals with the relations between functional components and thereby demonstrates what quantitative and qualitative constraints there are on combining units necessary for environmental interactions (cited from Barel et al., 1989). For instance, considering the eye alone, it may be concluded that increasing eye-size would improve the organism’s optical relations with its environment. However, to accommodate that larger eyes may require a diminishing of surrounding structures and a decrease of their adaptedness. 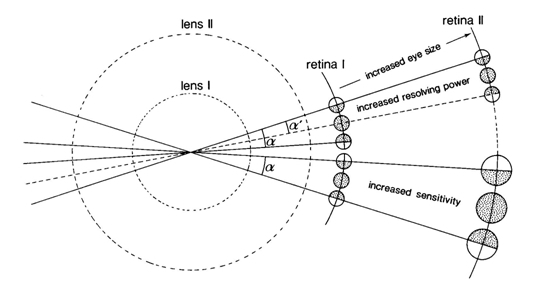 The overall contribution of all such changes to fitness has to be investigated before deciding that increased eye-size is adaptive (cited from Barel, 1993). Behavioural observations under natural conditions may provide data to produce mathematical models. With the use of these models one can investigate how natural behaviour contributes to the fitness of an organism (Krebs & Davies, 1978). A major question in behavioural ecology is whether behaviour is optimised under the influence of natural selection (Hoogerhoud, 1986). With respect to feeding behaviour this concept initiated the optimal foraging theory in fish (Werner, 1984), which predicts that efficient foraging is favoured through natural selection. Sense organs like eyes may be quite important in the efficiency of prey detection. 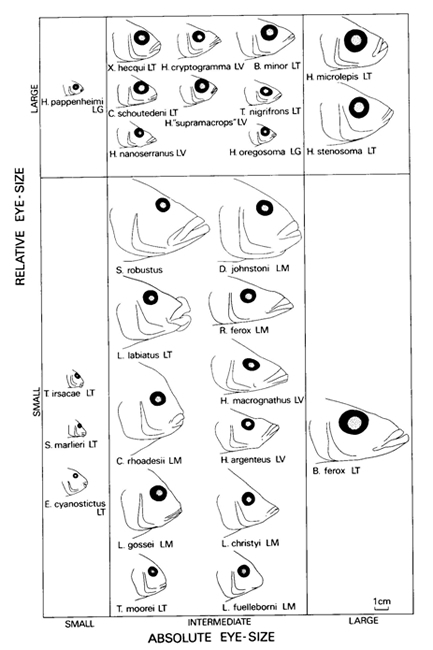 With this in mind one should consider visual capacities as a prominent factor in the competition of closely related organisms (cichlids) under ecological pressure (eutrophication). Selection pressure of the environment on morphological and behavioural aspects of an individual organism is probably one of the major processes in biological evolution.